Thomas Telford FRS, FRSE (9 August 1757 – 2 September 1834) was a Scottish civil engineer, architect and stonemason, and road, bridge and canal builder. After establishing himself as an engineer of road and canal projects in Shropshire, he designed numerous infrastructure projects in his native Scotland, as well as harbours and tunnels. Such was his reputation as a prolific designer of highways and related bridges, he was dubbed The Colossus of Roads (a pun on the Colossus of Rhodes), and, reflecting his command of all types of civil engineering in the early 19th century, he was elected as the first President of the Institution of Civil Engineers, a post he held for 14 years until his death. In 1787, through his wealthy patron William Pulteney, he became Surveyor of Public Works in Shropshire. Civil engineering was a discipline still in its infancy, so Telford was set on establishing himself as an architect. His projects included renovation of Shrewsbury Castle, the town's prison (during the planning of which he met leading prison reformer John Howard), the Church of St. Mary Magdalene, Bridgnorth and another church, St Michael, in Madeley. Called in to advise on a leaking roof at St Chad's Church Shrewsbury in 1788, he warned the church was in imminent danger of collapse; his reputation was made locally when it collapsed 3 days later, but he was not the architect for its replacement. As the Shropshire county surveyor, Telford was also responsible for bridges. In 1790 he designed a bridge carrying the London–Holyhead road over the River Severn at Montford, the first of some 40 bridges he built in Shropshire, including major crossings of the Severn at Buildwas, and Bridgnorth. The bridge at Buildwas was Telford's first iron bridge. He was influenced by Abraham Darby's bridge at Ironbridge, and observed that it was grossly over-designed for its function, and many of the component parts were poorly cast. By contrast, his bridge was 30 ft (10 m) wider in span and half the weight, although it now no longer exists. He was one of the first engineers to test his materials thoroughly before construction. As his engineering prowess grew, Telford was to return to this material repeatedly. In 1795, the bridge at Bewdley in Worcestershire was swept away in the winter floods and Telford was responsible for the design of its replacement. The same winter floods saw the bridge at Tenbury also swept away. This bridge across the River Teme was the joint responsibility of both Worcestershire and Shropshire and the bridge has a bend where the two counties meet. Telford was responsible for the repair to the northern (Shropshire) end of the bridge. Telford's reputation in Shropshire led to his appointment in 1793 to manage the detailed design and construction of the Ellesmere Canal, linking the ironworks and collieries of Wrexham via the north-west Shropshire town of Ellesmere, with Chester, utilising the existing Chester Canal, and then the River Mersey. Among other structures, this involved the spectacular Pontcysyllte Aqueduct over the River Dee in the Vale of Llangollen, where Telford used a new method of construction consisting of troughs made from cast iron plates and fixed in masonry. Extending for over 1,000 feet (300 m) with an altitude of 126 feet (38 m) above the valley floor, the Pontcysyllte Aqueduct consists of nineteen arches, each with a forty-five foot span. Being a pioneer in the use of cast-iron for large scaled structures, Telford had to invent new techniques, such as using boiling sugar and lead as a sealant on the iron connections. Eminent canal engineer William Jessop oversaw the project, but he left the detailed execution of the project in Telford's hands. The aqueduct was designated a UNESCO World Heritage Site in 2009. The same period also saw Telford involved in the design and construction of the Shrewsbury Canal. When the original engineer, Josiah Clowes, died in 1795, Telford succeeded him. One of Telford's achievements on this project was the design of Longdon-on-Tern Aqueduct, the cast-iron aqueduct at Longdon-on-Tern, pre-dating that at Pontcysyllte, and substantially bigger than the UK's first cast-iron aqueduct, built by Benjamin Outram on the Derby Canal just months earlier. The aqueduct is no longer in use, but is preserved as a distinctive piece of canal engineering. The Ellesmere Canal was completed in 1805 and alongside his canal responsibilities, Telford's reputation as a civil engineer meant he was constantly consulted on numerous other projects. These included water supply works for Liverpool, improvements to London's docklands and the rebuilding of London Bridge (c.1800). Many of Telford's projects were undertaken due to his role as a member of the Exchequer Bill Loan Commission, an organ set up under the Poor Employment Act of 1817, to help finance public work projects that would generate employment. During his later years, Telford was responsible for rebuilding sections of the London to Holyhead road, a task completed by his assistant of ten years, John MacNeill; today, much of the route is the A5 trunk road, although the Holyhead Road diverted off the A5 along what is now parts of A45, A41 and A464 through the cities of Coventry, Birmingham and Wolverhampton. Between London and Shrewsbury, most of the work amounted to improvements. Beyond Shrewsbury, and especially beyond Llangollen, the work often involved building a highway from scratch. Notable features of this section of the route include the Waterloo Bridge across the River Conwy at Betws-y-Coed, the ascent from there to Capel Curig and then the descent from the pass of Nant Ffrancon towards Bangor. Between Capel Curig and Bethesda, in the Ogwen Valley, Telford deviated from the original road, built by Romans during their occupation of this area. Further afield Telford designed a road to cross the centre of the Isle of Arran. Named the 'String road', this route traverses bleak and difficult terrain to allow traffic to cross between east and west Arran avoiding the circuitous coastal route. His work on improving the Glasgow – Carlisle road, later to become the A74, has been described as "a model for future engineers." The punning nickname Colossus of Roads was given to Telford by his friend, the eventual Poet Laureate, Robert Southey. Telford's reputation as a man of letters may have preceded his fame as an engineer: he had published poetry between 1779 and 1784, and an account of a tour of Scotland with Southey. His will left bequests to Southey (who would later write Telford's biography), the poet Thomas Campbell (1777–1844) and to the publishers of the Edinburgh Encyclopædia (to which he had been a contributor). An Act of Parliament in 1823 provided a grant of £50,000 for the building of up to 40 churches and manses in communities without any church buildings (hence the alternative name: 'Parliamentary Church' or 'Parliamentary Kirk'). The total cost was not to exceed £1500 on any site and Telford was commissioned to undertake the design. He developed a simple church of T-shaped plan and two manse designs – a single-storey and a two-storey, adaptable to site and ground conditions, and to brick or stone construction, at £750 each. Of the 43 churches originally planned, 32 were eventually built around the Scottish highlands and islands (the other 11 were achieved by redoing existing buildings). The last of these churches was built in 1830. Some have been restored and/or converted to private use. Other works by Telford include the St Katharine Docks (1824–28) close to Tower Bridge in central London, where he worked with the architect Philip Hardwick, the Gloucester and Berkeley Ship Canal (today known as the Gloucester and Sharpness Canal), Over Bridge near Gloucester, the second Harecastle Tunnel on the Trent and Mersey Canal (1827), and the Birmingham and Liverpool Junction Canal (today part of the Shropshire Union Canal) – started in May 1826 but finished, after Telford's death, in January 1835. At the time of its construction in 1829, Galton Bridge was the longest single span in the world. He also built Whitstable harbour in Kent in 1832, in connection with the Canterbury and Whitstable Railway with an unusual system for flushing out mud using a tidal reservoir. He also completed the Grand Trunk after James Brindley died due to being over-worked. On the 23rd [August 1834] Mr Telford was taken seriously ill of a bilious derangement to which he had been liable … he grew worse and worse … [surgeons] attended him twice a day, but it was to no avail for he died on the 2nd September, very peacefully at about 5pm. … His old servant James Handscombe and I were the only two in the house [24 Abingdon Street, London] when he died. He was never married. Mr Milne and Mr Rickman were, no doubt, Telford's most intimate friends. … I went to Mr Milne and under his direction … made all the arrangements about the house and correspondence. … Telford had no blood relations that we knew of. The funeral took place on the 10th September [in Westminster Abbey]. … Mr Telford was of the most genial disposition and a delightful companion, his laugh was the heartiest I ever heard; it was a pleasure to be in his society. Thomas Telford was buried in the nave of Westminster Abbey; a statue was erected to him nearby, in St Andrew's Chapel adjoining the north transept. Throughout his life Telford had a great affection for his birthplace of Eskdale and its people and in his will left legacies to the two local libraries at Westerkirk and Langholm. The "narrow house" of Burns. These accents strike the ear. Ah! now they ring thy knell. To crown thy hallowed pile. And SCOTLAND boasts of BURNS. His ability and perseverance may be understood from various literary compositions of after life, such as the articles he contributed to the Edinburgh Encyclopædia, such as Architecture, Bridge-building, and Canal-making. Singular to say the earliest distinction he acquired in life was as a poet. Even at 30 years of age he reprinted at Shrewsbury a poem called "Eskdale", … Some others of his poems are in my possession. Statue of Thomas Telford outside the law courts in Telford, Shropshire. When a new town was being built in the Wrekin area of Shropshire in 1968, it was named Telford in his honour. In 1990, when it came to naming one of Britain's first City Technology Colleges, to be situated in Telford, Thomas Telford was the obvious choice. Thomas Telford School is consistently among the top performing comprehensive schools in the country. In Langholm, where Telford was an apprentice in his early years. Telford Hall is a hall of residence at Loughborough University named after Thomas Telford. A plaque in his honour hangs in the hall's common room. Edinburgh's Telford College (incorporated into Edinburgh College since October 2012), was named in honour of the famous engineer. Telford's autobiography, titled The Life of Thomas Telford, Civil Engineer, written by himself, was published in 1838. ^ Waterston, Charles D; Macmillan Shearer, A (July 2006). Former Fellows of the Royal Society of Edinburgh 1783–2002: Biographical Index (PDF). II. Edinburgh: The Royal Society of Edinburgh. ISBN 978-0-902198-84-5. Archived from the original (PDF) on 4 October 2006. Retrieved 25 September 2010. 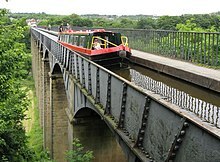 ^ "Pontcysyllte Aqueduct and Canal". UNESCO – World Heritage List. UNESCO. Retrieved 17 January 2017. ^ "Engineering Timelines – Thomas Telford". engineering-timelines.com. Retrieved 26 September 2014. ^ Mort, Frederick (2012). Lanarkshire : Cambridge County Geographies. Cambridge University Press. p. 133. ISBN 9781107616707. ^ Bellis, Mary (2007). "Thomas Telford". About: inventors. About, Inc, New York Times. Retrieved 19 January 2007. ^ "Colossus of Roads?". Feature on Telford's testament. National Archives of Scotland. 2007. Retrieved 21 August 2007. ^ Anne Burgess (March 2014). "Thomas Telford's Parliamentary Kirks". Geograph Britain and Ireland. licence: cc. Retrieved 5 March 2017. ^ "RIAS Awards 2013". The Royal Incorporation of Architects in Scotland. Retrieved 5 March 2017. ^ Structurae: International Database and Gallery of Structures, retrieved 2009-05-27. ^ "Press and Journal – Article – Bridge of Keig closes amid fears". web.archive.org. Archived from the original on 2012-03-20. Retrieved 26 September 2014. ^ a b Telford, Thomas (1838). John, Rickman, ed. Life of Thomas Telford, civil engineer, written by himself, containing a descriptive narrative of his professional labours, with a folio atlas of copper plates. London: J. and L.G. Hansard and Sons, sold by Payne and Foss. ^ Robertson, David. "GCSE: Top comprehensive schools". Times Online. Retrieved 25 January 2010. ^ Tattrie, Jon (17 September 2008). "Shubenacadie Canal bridge underway". Metro News. Free Daily News Group Inc. Retrieved 28 October 2014. ^ Telford, Thomas; Rickman, John (1838). Life of Thomas Telford, civil engineer, written by himself: containing a descriptive narrative of his professional labours : with a folio atlas of copper plates. London: Printed by James and Luke G. Hansard and Sons ... and sold by Payne & Foss ... OCLC 271476168. Wikimedia Commons has media related to Thomas Telford. "Telford, Thomas" . Encyclopædia Britannica (11th ed.). 1911.